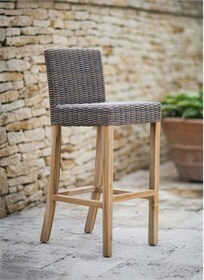 The perfect stool to match our St Mawes Bar Table, the Lymington Bar Stool has been created with wonderful natural teak legs and a PE Rattan half weave seat and back, making it perfect for slotting neatly under a high table or bar. Ideal for weathering our British summers, this bar stool is weatherproof, robust and looks seriously smart wherever you choose to place it. You and your guests will be sitting back and relaxing in the garden in no time.